The Snooze Button Generation 2019: The polar bear is about to die! My daughters and I are addicted to the classic game "Don't Break the Ice" and vow to "play just once more and then easily stop if we want." We each have different styles of breaking the ice as we attempt to save the red polar bear from falling to his death. Like a surgeon, I carefully knock out cubes. Sophie and Chloe replicate my style, but when the polar bear comes close to falling, they have different reactions. Sophie, 5, announces, "I'm scared!" In contrast, Chloe, 3, pounds all the ice around the polar bear to make sure he does indeed fall. Sophie and I react shocked every time she does this, although it is no longer a surprise for us and we continue to be undefeated against Chloe. "Don't Break the Ice" originated in 1968, and I enjoyed it as a lad years later. I must have passed some sort of gene to my daughters to like the game as well. 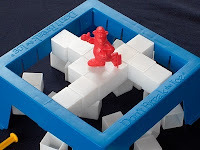 After a gluttony of Christmas gifts, "Don't Break the Ice" somehow has emerged as our favorite despite having many more expensive and "classy" games. Despite my ability to quickly post blogs, Sophie is demanding that I play another round of "DBIT" with her as I type. No problem. One day, we may branch out to "Cootie" and/or "Ants in the Pants." It may be one day after Christmas, but I will be saying "Merry Christmas to you AND YOURS" for at least a few more days.